This special slipcase set has been created to celebrate our landmark 40th anniversary by spanning and including music from the whole forty years . It contains the newly released “Plankton. b. 6th May 1978. 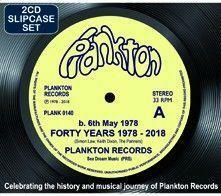 The Second 20 Years” CD (Cat No: PCDN 174) along with the album released in 1978 to celebrate our 20th Anniversary ” Plankton. b. 6th May 1978. The First 20 Years” CD (Cat No: PCDN 153), thus celebrating the full 40 year history and musical journey of Plankton Records in this one music-packed package. The set includes some previously unreleased tracks as well as some long deleted tracks that are not available elsewhere and a brand new song recently recorded for inclusion on the new release (Simon Law – The Haven). Both of these compilation CDs were hand picked and compiled by the Plankton Records partners – The man who founded the label, Rev Simon Law and Keith Dixon, who has been a partner since 1991 and has effectively been running the label on a day to day basis since 1978. This is a hand-picked selection of the best music from Plankton Records celebrates their 40th Anniversary of releasing Christian music. Originally Plankton Records was set up by Simon Law so that his Christian rock band had some way of releasing their music, since then they have provided services for many different bands who are included on this compilation. It is hard to think that these guys have been releasing music as long as I have been alive, but it does put their commitment into some context, because it's not an easy world to inhabit and while it is a business, it is also a labour of love to release music that glorifies the name of Jesus. This release is actually 2 different albums which showcase bands from the first 20 years on the first, and the second 20 years on the second disc. So the collection actually starts and ends with the founder Simon Law, the first couple of recordings are from his original rock band Sea Stone and the last is his first ever solo track released as a single as part of the anniversary called "Haven". Inside the album liner there are no lyrics for the tracks, but there are some brief thoughts or memories from the main partners of the company Simon Law and Keith Dixon (who joined Plankton in 1991 and manages the day-to-day running of the label). These do add some interest to the album because they are often funny or poignant memories, like the first track where Simon explains that he wasn't allowed to use his Marshall stack because the producer wouldn't let him, because it was too loud! As a listener there is a bit of a walk through some of the different styles of the late 70's through to the 90's on this first album. Not all of the tracks are overtly about Christian themes although the first track "Rolling Stone" is very much about Him, but the very next track is about being unemployed. Plankton were marked out as a company that would take a risk with various bands that were not necessarily going to sell millions, but had something to say, bands that the bigger Christian record labels weren't willing to take a risk with. So Plankton became home to bands like Solid Air, Newshounds and Simon Law's bands Intransit and Fresh Claim amongst others. There are some great tracks on this first disc, quite a few by bands that I have not heard of until now. One band featured on this first album is Catch 22 who won a battle of the bands at Greenbelt Festival and won some recording time, their single "Freeway to Paradise" is included on this release and is quite an interesting listen! This first disc takes us to 1998 where some things seemed to change with Plankton, Simon felt the call to serve God in different way and became a Curate and then eventually a Rector. Keith was also involved in other projects that took both time and energy and for a time there were only a few releases put out and then there was a five year break before they revitalised the label. The first disc bows out with Keith introducing a special anniversary fanfare which shows the humour that these guys have. So the second disc actually opens with some tracks that for various reasons didn't make it onto the first disc, so another track from Intransit and Fresh Claim as well as tracks from Pete Ward and also the Really Free Band. 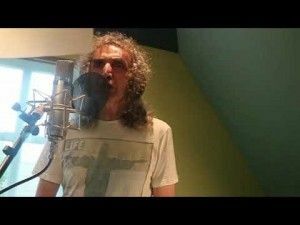 The second 20 years begins properly with a track from Ben Okafor who appears quite a few times in the first 20 years, as well as another track on this album, this is a rootsy reggae track called "Palace" from his "Coffee With Lazarus" album. There are a few more tracks from Fresh Claim also on this second disc and you can hear some of the progression through the years in their style on this album as a whole. There are also one-off tracks from artists like The Mohabir Sisters, Inspire Songwriters, Vivienne Neville, Liz Clarke and Disciplemakers. There are also some artists that I am much more familiar with featured on this album as I have reviewed some of their albums. Echo, the excellent soul group that have re-framed many familiar tracks with a Christian edge have a couple of tracks on this album. Matt JR Hurley's single "Pebbles" that was released as a forerunner to his EP "Raising Questions" is on this collection, as is the very funky "Salvation Shoes" from The Darn Funk Orchestra and "Nine Beats to the Bar" single from the Nine Beats Collective. If you are looking to chart the state of the UK Christian music scene over the last 40 years then this double album is a must-have collection. Many of these early bands have broken up and the members are doing different things now, but their legacy will live on in this collection. Other artists featured here have gone onto other things and their work with Plankton gave them a start. This whole album is a testament to what Plankton have enabled within the Christian music scene in the UK and along with them I look forward to hearing what is going to happen in the next 20 years.